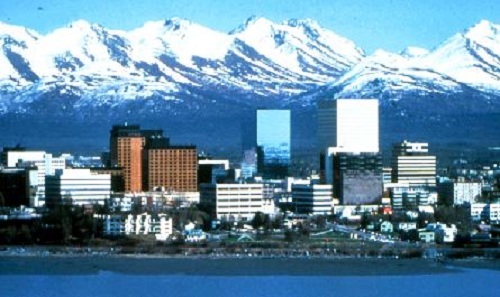 Anchorage is the largest city in Alaska and covers an area about the size of the State of Delaware. To travel from one end of the Municipality of Anchorage to the other you would start at Portage Glacier and end at Eklutna, a mere 84 miles away. Anchorage is located at the base of the Chugach Mountains, and along the coast of Cook inlet in South Central Alaska. Contrary to popular belief, there are no igloos in Alaska. We do have 24 hours of daylight to twilight at the Summer Solstice in June and this drops to five and half hours of daylight at the Winter Solstice in December. Anchorage and most of Alaska is on Alaska Standard Time, which makes us one hour behind Pacific Standard Time, and four hours behind Eastern Standard Time. For instance, if it is 7 am here, it is 8 am in Seattle and 11 am in New York. Needless to say, we have to get up early to make phone calls to the East Coast. We have numerous beautiful views in Anchorage, and on clear days we can see Mount McKinley, known to locals as Denali (The Great One). Across Cook Inlet we can see the Alaska Mountain Range in the distance. We have resident moose, bears, foxes, wolves, Bald Eagles, Ravens and other wildlife in the city. While most of us live in the city, it is a short drive in any direction to be in the wilderness. In the summer, most of us are out fishing, camping, hiking, gardening or just out and about enjoying the long, warm, days. 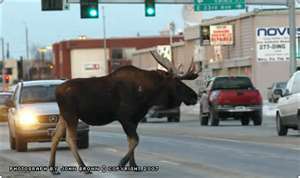 One of Our Many Jaywalking Moose! The Lower 48 is how we refer to all the states that are south of Alaska. Just going Outside (to the Lower 48), involves either a three and half hour plane ride to Seattle, or three to four days on the road through Canada to reach the United States Border. Without the marvelous invention of the Internet, Ancestry.com and other wonderful genealogy sites we would have to wait awhile for our inquiries to be answered, or visits with relatives outside.